Soaring Fox is an annual incident competition hike for Scouts and Explorers held in March. It is based in Leicestershire, United Kingdom, but is open to any Scout troop or Explorer unit. The hike is around ten miles long for Scouts and around twelve miles for Explorers. Teams of between four and six Scouts / Explorers navigate the route on their own, with no shadow walker, and complete challenges at bases. Teams’ progress is carefully tracked and monitored by an experienced team of radio operators and sweep teams to ensure safety. The venue, route and incidents are all different every year. The teams are given the route details and maps (A3 format) the week before the event so they can plan their route using a standard route card. They arrive at the campsite on the Friday night, handing in their route card for staff to check, pitching tents and attending a briefing. 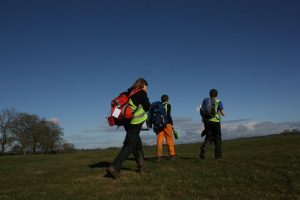 After a thorough kit check, Scout teams depart on the hike from Saturday morning to afternoon, with the least experienced teams departing first. Explorer teams depart in the early evening, returning in the late evening. The results of the competition are announced on the Sunday morning and the trophies and prizes are presented. If your Scouts / Explorers would like to enter our next hike, please go to the How To Enter page for details. 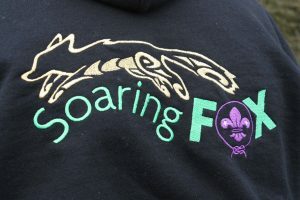 Scouts and Explorers can achieve the requirements for many activity and challenge badges by taking part in Soaring Fox. 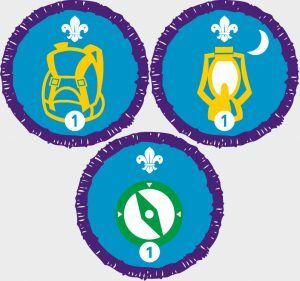 The staged activity badges Hikes Away, Nights Away and Navigation can all be achieved by Scouts and Explorers. Many of the requirements for the Scout’s challenge badges Adventure, Outdoor, Skills, Teamwork and Team Leader can also be achieved. 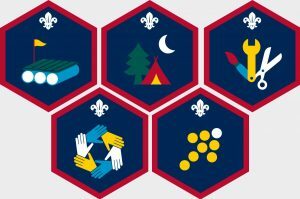 Go to https://members.scouts.org.uk/supportresources for full details.